What better way could there possibly be to celebrate the festive season than by going racing?!?! Well, that is exactly what all the stars and their cars of the Sims Metal Management Pro Dirt Series will be doing this Wednesday night, Boxing Night, as they vie for honours in what will be Round Seven of the Championship, and as if this wasn’t enough, as an extra special Christmas treat, we have a number of exciting additions to this weekend’s field, including two Americans who have arrived early and are ready to put on a show for the Aussies! The Roth Motorsports team of Jeff Roth and Joe Godsey have jetted in early prior to the Di Candilo Steel City USA vs WA Invasion Tour and Late Model Nationals and are keen to get some laps in at the Motorplex before the big events. 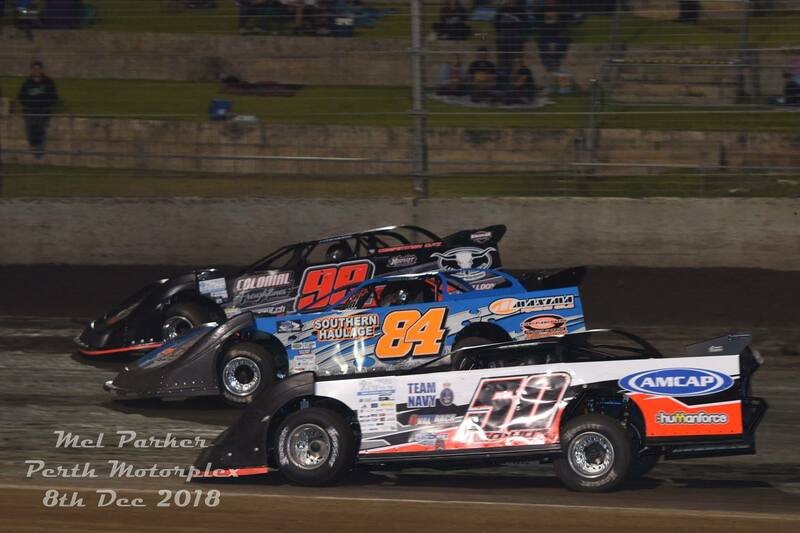 Godsey did similar last year and was an unfortunate DNF in his first run at the venue, so will be keen to rectify that this time around, while Roth has only run two events at the Motorplex, coming home tenth in both. Both drivers are exciting to watch and now with some track knowledge will be right on the pace come feature time. All the regular drivers are also in the twenty three car field and with series points still on offer, they are sure to be fighting tooth and nail. Sims Metal Series leader Michael Holmes is coming off a string of good results and would love to extend his lead with another win nextthis Wednesday night while second placed Jay Cardy is nipping at his heels and desperate to claim a feature win after being so close on many occasions already this year. Marc Giancola is thirsty for revenge after having the last feature race shot to pieces only to suffer mechanical dramas with a lap to go while Paul Stubber and Kye Blight are also back and expected to make an impact as they look to prepare themselves in the best possible way for the upcoming Nationals. Warren Oldfield is again back in the field and running his regular #15, while Brad Blake is also nominated in the #0 after running Dale Clark’s #3 at the last show. Last start winner ‘The Black Knight’ Ryan Halliday is also all revved up and ready to grab another feature win. All three are strong contenders and have many feature wins to their names so could be in with a real chance on Boxing Day. Making his debut in the Late Models is former Modified Sedan competitor Aydan Trewern. Based out of Albany, Trewern will be piloting the former Nat Muir Rocket and shouldn’t take long to adjust, given that he has driven plenty of different divisions in the past with much success, including currently leading the list of A Main winners in the WA Modified Sedan Series (since it began at the start of the 2008/2009 season). Add in all the regulars including the impressive Ken Macpherson, ‘Red Hot Roni’ Veronica McCann and the very quick Brent Vosbergen and there are so many contenders for the top spots that you simply cannot miss a single second of the action! Engine Starts and qualifying for other divisions begin around 4.30pm next Wednesday evening, with Late Models scheduled to hit the track for the first of four heats (two per driver) at about 7pm. These heats will be held over eight laps, prior to a thirty lap feature event. The Sims Metal Management Late Model Pro Dirt Series and Di Candilo Steel City Invasion Tour, proudly bought to you by Global XLI, Boyes Mechanical, Cardy Racing Components, Dirt Track Nutters, Pancho’s Mexican Restaurants, APM Roofing, CTM Recruitment, RACIN, Collie Machine Shop, Grays Online, Mac Track, Rockingham Towing, Baldivis Pharmacy, Mezzstor, Palice Property Group, Michael Holmes Racing, West Coast Big Bike Hire, Our Car Autos, Homes by Roth, Dirt on Dirt, QB Metal Recyclers and Bulk Metal Recycling. 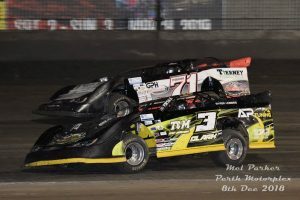 Pictures: The action is sure to be hot and heavy as the Late Models fight it out once again in the Boxing Day Bonanza. Mel Parker Photos.